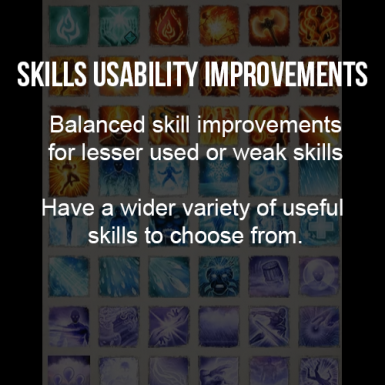 Balanced skill improvements for lesser used or weak skills. Gives you a wider variety of viable skills to choose from. More options = better replay value. It's a shame that the game has a lot of interesting/exciting skills which will almost never get used due to being underpowered or too situational. This mod aims to fix that. Balanced skill improvements for lesser used or weak skills. Gives you a wider variety of viable skills to choose from. More options = better replay value. It's a shame that the game has a lot of interesting/exciting skills which will almost never get used due to being underpowered or too situational. This mod aims to fix that. A lot of changes are aimed at mages and especially Summoning. Update 2 - 3 new skills changed - Bleed Fire, Dimensional Bolt, Tornado. New skills - Air Blood, Water Blood, Earth Blood, Poison Blood, Execute (Assassinate skill for scoundrel instead of hunter). Summoning buffs implemented. Update 1 - Fixed some skill icons, and cursed electric infusion which was causing crashes. I've started with some simple changes and I'm planning more. I appreciate all feedback and suggestions. Tell me what you like or don't like. If there's something that's bad/too overpowered, please let me know. If you like a few of these changes more than the others, let me know. I'll separate them into a different mod, especially if some of the changes are plain bad. Some skills will update automatically. For others, you'll have to acquire the correct skillbook again and re-learn it. You'll keep the old as well as the new changed skill. Traders with the new added skills can be found in major areas. Fort Joy - Near the smith Nebora. Reaper's Coast/Driftwood - Outside the Driftwood Inn. Nameless Isle - At the beach you land at. Arx - In the main square where the traders are, north of the main entrance. The rest are updated automatically. Though I intended to maintain balance, just having more strong skills may make the game easier for you. Try playing at a higher difficulty or use a mod which increases the number of enemies or the difficulty. This just replaces some skills and a few status effects, so it should not clash with any other mod unless the mod affects the same skills. Summoning skill changes - You can have 2 active summoned creatures at a time, instead of just 1. The summoning stat increases summons' health etc. by 10% per point invested instead of 5%. Bleed Fire - The "bleed fire" effect is no longer resisted by magic armour. Fire resistance is reduced by 40% instead of 20%. Reliable way to decrease enemy resistances in an AoE. Burning is still blocked by magic armour. Dimensional Bolt - Now does 125% damage instead of the old 77%. Tornado - A tornado that actually feels like a tornado! Does 100% damage, applies knocked down (resisted by physical armour) and dazed. Still clears surfaces and statuses as before. Cooldown reduced from 10 turns or whatever ridiculous amount it was to 3. As this can clear statuses from allies, it can damage them too! Execute (Assassinate for Scoundrels) - Similar to the huntsman skill assassinate. Requires daggers, can backstab. Does 115% damage, with 50% more when in stealth. Applies bleeding, resisted by physical armour. Good for starting battles with your scoundrel. Water/Air/Earth/Poison blood - Bleed fire, now in every flavour. Applies AoE resistance reduction of the associated type, while creating an associated surface and making the enemies bleed that surface when hit. You can abuse the surface creation by combining skills (Earth + fire = explosion), but only one "bleed" effect is active at a time. Provoke - Vanilla Taunt is unreliable, enemies still ignore the provoker and go for the weakest character. The new Provoke actually works, by reducing the caster's HP to 1 and giving them Living on the Edge/Death resist for 2 turns, along with bless for a little resistance for tanking hits - so you have time to heal them back up. This ensures that the enemies target them. Reduced 100% chance of success to 80%. Area of effect doubled. Onslaught - Increased damage multiplier from 50 to 75. Marksman's fang - Always been hard to aim, slightly easier to aim now because of a small area of effect attached to the arrow. Aim at the farthest enemy and try to make the nearest enemy block the visible trail - this seems ideal. Glittering dust - Adds 1 turn blind, similar to throw dust, along with the existing effect. Fireball - Just a pet peeve, I hate that goes in a straight line. Now it has an arc to it similar to Flaming daggers or arrows. Firebrand - Gives a 50% damage boost in addition to adding fire damage to allies. Viable buff. Flaming tongues - Applies suffocation to enemies close enough to be hit by the tongues. Daggers drawn - Increased damage multiplier from 55 to 75, and hides in the shadows after the attack to prepare for the next. Bless - 2 AP cost instead of 1 SP 2 AP. The blessed effect now also increases damage by 30%. Steam lance & Arcane stitch - Both skills add a blessed buff effect to targets hit. Bloated corpse - Summons a corpse anywhere, without requiring a corpse first. Summoning combination skills - Poison, fire, electric, water infusion - Now summon a incarnate with the associated infusion. 2 AP and 6 cooldown like the normal summon incarnate spells. Summoning combination skills - Acid, cursed fire, cursed electric, ice - Summons an incarnate with the associated infusion, for a 2 AP 1 SP cost with a 6 turn cooldown. Supercharge - Damage boost is 140% instead of 70%. Door to Eternity - Now affects all allied summons, not just those controlled by the caster. Gives DeathResist, and adds a damage buff to the summon for each allied summon in the area. Powerful buff for a party with lots of summons. Ethereal Storm - Water and Poison bolts changed so that your undead allies may be healed, and undead enemies won't be healed by mistake. Increased area of effect and number of bolts, but number of bolts are slightly random. Pressure spike - Increased damage multiplier from 70 to 80. Vaporize - Deals damage now, same as Pressure Spike. 1) LaserRay - Difficult to aim - gets messed up very easily by elevation differences. 2) More archetype-heavy changes - Scoundrel skills should be more about stealth and damage. Warfare should have more tanking options. Check out my tank warrior mod for this. 3) Some skills may be unbalanced right now. Again, happy to answer questions and take feedback and suggestions.